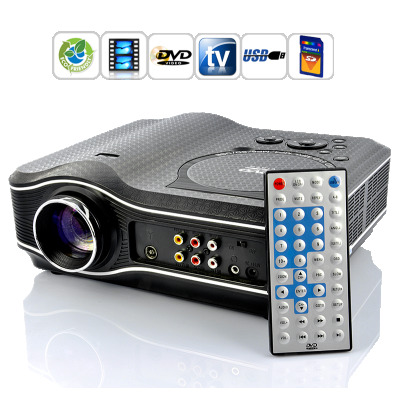 Successfully Added Multimedia LED Projector with Built-in DVD Player to your Shopping Cart. Multimedia LED projector with built-in DVD player that plays DVDs, movies directly from the USB drive, or connect to any other video source - your all-in-one solution for enjoying movies! Crisp Clear images: The LED light source delivers a wider color range and deeper color saturation than traditional lamps and provides clear, crisp images for any type of media from videos and TV. This LED projector will truly bring your movies to life in big screen splendor. True Multimedia All-in-one: Apart from playing DVDs or movies from a USB drive/SD card, this projector can also be connected to your home video system, or receive analog TV with the included antenna. It’s compact and portable, and can be used in any number of settings such as offices, conference rooms, classrooms, living rooms, etc.